Now that we have the widget we need to actually show it when people right-click on our TreeView. We didn’t have to add a button press handler to our TreeView because we added one in the last tutorial, but we will have to edit it. the selection. Perhaps there is a better way? 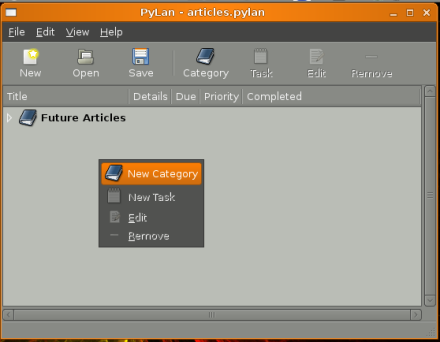 So far so good, you’ll notice that since the menu handlers are the same as our toolbar handlers everything already works! The only problem is that the sensitive state of the menu items does not match the sensitive state of the toolbar buttons. Thankfully since we added this feature to the buttons in the last tutorial doing this is pretty easy. 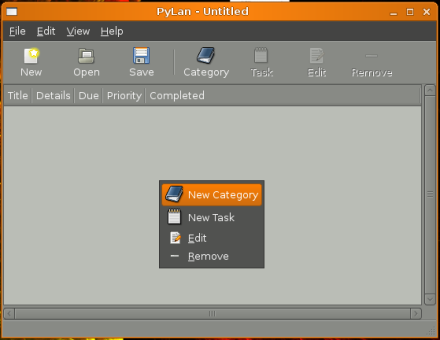 Now we have nice context menus! Link to ‘Part two’ of article turns out into “Error 404 – Not Found”; a fix is needed. Thanks for the catch, I have fixed the link. Hi, I’ve come to your site in a round-about way from a site about autoglade. I see your articles on pyGTK hold the answers to some questions I’ve had for a while and I look forward to working through them. But I have to ask, what is the window/gtk theme you’re using in these screenshots? It looks very elegant and I’d like to try it out. HI Matthew, right now I’m using Darkilouche as my theme. Great tutorial. Thanks a mil! The above error occurs in Windows XP it seems. I used Python 2.5. In Debian GNU/Linux it works with both 2.4 and 2.5. Found the bug. 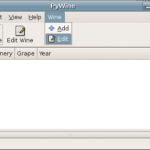 In the save_to_file function the todo_file is opened with “w”. According to the manual it needs to be opened with “wb” when using cPickle and dump. Thanks! Great catch! Sorry I wasn’t able to respond to your comments yesterday, but I’m really glad that you found the problem. I will update the source when I get a free moment. At some point in time I should use some source code repository so that people can make changes and fix it up themselves. Next Next post: Python Magazine Issue One!